Audience: Bilingual staff and contract interpreters in healthcare, legal services, law enforcement, social services and community services. Prior completion of a 40-hour interpreter training foundation program and interpreting experience are required. Domestic violence… Sexual assault… Child abuse… Refugees… Every day interpreters witness terrible suffering in hospitals, schools and social services. Who is preparing them to cope? This two-day workshop focuses on specific techniques, strategies and self-care practices for interpreters who encounter trauma in any setting. The workshop will highlight mental health, medical and legal services. The techniques explored can be applied to healthcare, schools and social service settings. Through discussion, film vignettes, activities and role plays, interpreters will plunge into the field of victim services. By exploring how they can interpret effectively without re-traumatizing the survivor, interpreters will learn the value of professional boundaries. The workshop concludes with a half-day module on interpreter stress, vicarious trauma and self care. 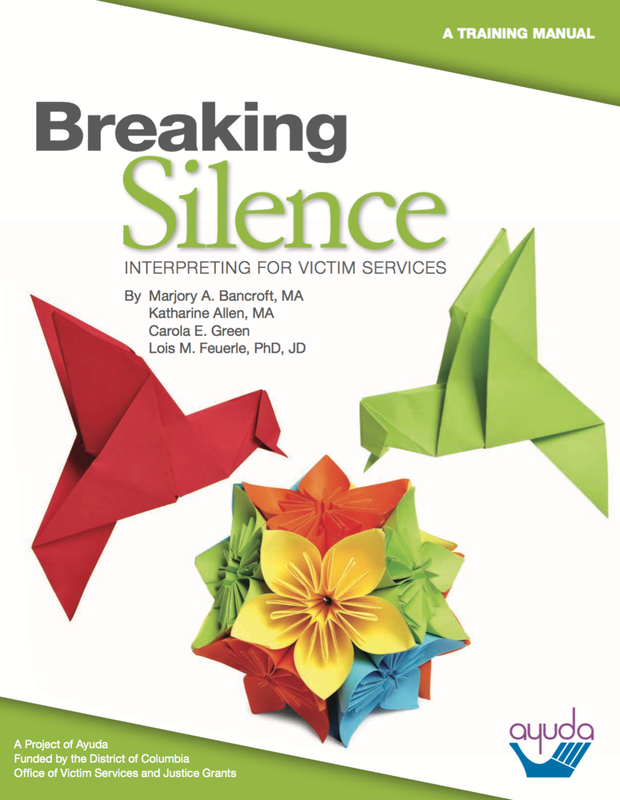 Each participant will be provided with a print copy of the following materials, authored by national experts in the field with the contributions of more than 20 victim service providers in Washington, DC. Note: The development of this innovative program, created by Cross-Cultural Communications, was funded by the DC Office of Victim Services and Justice Grants. Very insightful and very clearly explained. Great books and materials. Amazing teacher, very direct and compassionate. Clear explanations, clarifying answers. Role play allows us to test our skills in a fun way. Open discussion allows us to share knowledge and learn from each other. Marjory is well-versed in so many languages and cultures. She is an asset to the program [and] culturally and linguistically sensitive to all our various similarities and differences. Marjory is an excellent trainer - engaging, [culturally] sensitive, eloquent, animated and positive, caring. Excellent information and use of activities.